A man who was hailed as a hero after scaling a building to save a child dangling from a Paris balcony will be granted French citizenship and was offered a job as a firefighter. Mamoudou Gassama, 22, a Malian illegal migrant, met with French President Emmanuel Macron Monday at the Elysee Palace, just two days after his daring rescue was captured in a now-viral video. Gassama scaled four floors of a building in northern Paris on Saturday to save a 4-year-old boy, Sky News reported. A man in the neighboring balcony was attempting to hold the child up before Gassama reached out with his right arm and pulled the child to safety. Gassama, who was dubbed a “real-life Spiderman,” said the boy was crying and had an injured foot. Bystanders captured the rescue on video, which was viewed millions of times on social media platforms. The French president said Gassama, who was in France illegally, will be granted citizenship and offered a new job with the Paris fire brigade. Gassama had arrived in Paris a few months ago in hopes of starting a new life, Paris Mayor Anne Hidalgo told Sky News. “I told him that his heroic act is an example to all citizens and that the city of Paris will obviously be very keen to support him in his efforts to settle in France,” Hidalgo said. Macron also gave Gassama a medal and certificate for his bravery. Police later questioned the boy’s father for leaving the child unattended. The boy’s mother was reportedly not in Paris at the time. Mamoudou Gassama, the young Malian hailed as a hero in France for scaling a multi-storey building to rescue a child hanging from a balcony, is no stranger to danger. 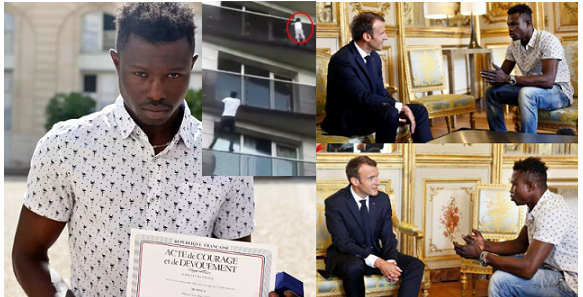 The 22-year-old “Spiderman”, who was honoured by President Emmanuel Macron at the Elysee Palace and offered French citizenship, braved the Sahara desert, Libyan gangs and the Mediterranean Sea during his long odyssey to Europe. In 2013, the shy youth from the southwestern Malian town of Yaguine hit the migrant trail which claims thousands of lives each year. “I had no means to live and no-one to help me”, Gassama, who followed an older brother to France, explained to Macron. He travelled through Burkina Faso and Niger north to Libya, the main launching pad for clandestine crossings to Europe. He spent a year working in Libya, where armed gangs prey on migrants, routinely kidnapping them for ransom and even sometimes enslaving them. A year later, he sailed to Italy in one of the packed migrant boats that regularly sink. “It was terrible. There were a lot of people,” he told France’s BFM news channel. From there he continued on last year to France, where he joined relatives in the eastern Paris suburb of Montreuil, nicknamed “Little Bamako” after its large Malian population. His home, which he shares with relatives, is a cramped 15-square-metre room in a migrant workers’ hostel, with a mattress on the floor for a bed. Gassama, who did not seek asylum in France, making him an economic migrant at risk of deportation, has been doing odd jobs in construction. But his life changed dramatically Saturday, when he came to the rescue of a four-year-old boy who was spotted dangling from a balcony on the fourth-floor of a building in northern Paris. The video of him pulling himself up from balcony to balcony with supreme ease has been viewed millions of times on social media, propelling him to stardom. On Monday morning he was ferried to the Elysee Palace for an audience with the president, who listened smiling to his account of the rescue and presented him with a medal for his bravery. “I’m pleased because it’s the first time I’ve received a trophy like that,” Gassama said afterwards. “We proud of him,” his older brother Birama, 54, told AFP, describing his sibling, a keen footballer, as someone who “likes to help others”. Not only will Gassama receive a French passport, Macron offered the plucky youth with preternatural agility a job with the fire service. “You have become an example because millions of people have seen you. It is only right that the nation be grateful,” Macron told him.